Sister Carolyn Smith was baptized in Jesus’ name and received the Holy Ghost as a child in Chicago, Illinois at the Bethlehem Healing Temple Church under the leadership of Bishop Charles E. Poole and Evang. Mattie B. Poole. After graduating from the University of Illinois, Sister Smith moved to Atlanta, Georgia in 1977 and began attending Bethlehem Healing Temple under the leadership of our late Bishop Dr. Louis H. Jackson, Sr. and Evangelist Mildred Jackson. After marrying District Elder Allen Smith and raising five beautiful children, Sister Smith has served as Sunday School teacher, church secretary, and just recently called to Bible teacher under the auspices of our late pastor and founder Dr. Bishop Louis H. Jackson. 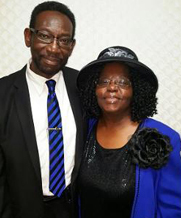 After retiring from the Fulton County School System, First Lady Carolyn Smith continues to faithfully serve Greater Atlanta Healing Temple Church by her husband’s side.